MACK warranty program is designed to provide you with additional coverage for manufacturer defects. Whether it be Murphy's Law or just "luck", electrical malfunctions seem to take place the day after the Manufacturer Warranty expires. The Mack Camera Extended Warranty offers you that peace of mind for those unexpected malfunctions and costly repairs. When you purchase a Mack Camera Extended Warranty, you are truly making a smart investment for your equipment. Mack Camera and Video Service, established in 1938, has been a leading repair center in the Tri-State area for over 60 years. MACK currently service equipment ranging from 35mm Cameras to Digital Video Equipment, PDA's, DVD Players, Televisions, VCR's and Laptop Computers. MACK's repair facility is factory authorized for manufacturer warranty repairs and technicians are factory trained to repair your equipment to manufacturer specifications. By working with Mack Camera and Video Service you are investing in a customized repair and service program for your new equipment. Please note, a Mack Camera Worldwide Warranty must be purchased within the first 30 days of the purchase of your equipment. If you should require service under your warranty plan, you will be required to provide a dated proof of purchase for your equipment and the extended warranty plus your warranty registration number. Please be sure to retain all copies for your records! Warranty Service - What is Covered? Your Mack Camera Extended Warranty covers manufacturer defects that can result in the loss of operation to your equipment. to you, truly making this Extended Warranty a smart investment for your equipment. or damaged as a result of accident, liquid, grit, impact or lack of proper care as indicated in the manual of operations. Accessories are not covered under the terms of the warranty. The advantage of the Mack Camera Worldwide Extended Warranty is the opportunity for worldwide service. you are protected from any out of pocket expenses you may incur due to manufacturer defects of your equipment. and a brief description of the problem you are experiencing. You will receive an authorization number for service via email. It's that easy!! your equipment and a brief description of the problem you are experiencing. You will receive an authorization number for service via email. It's that easy! Make sure your service contract is registered online. Your request will be assigned to an agent within 24-48 hours. Stay current with the latest updates regarding your repair. All repairs must be completed at a manufacturer authorized service centre in your area. 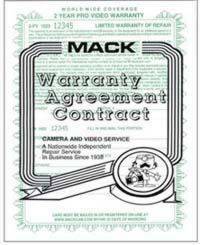 Mack Camera will issue you a ticket number to obtain an estimate for the repair. any other cables or attachments. - Ship your product in a corrugated cardboard box. - Secure your equipment in at least 4-5 inches of thick bubble wrap and be sure the equipment cannot move freely in the box. Do not use newspaper to secure your equipment!!! - Mack Camera highly recommends that you have your package insured by your carrier/postal service when you ship it. This may already be included in your shipping charge; check with your carrier. - We also recommend you use a shipping carrier that provides package tracking such as UPS or FedEx. his will ensure that your package will arrive at its destination. or other external cords. Please refer to the individual Warranty Plan you wish to purchase for complete list of coverage terms.